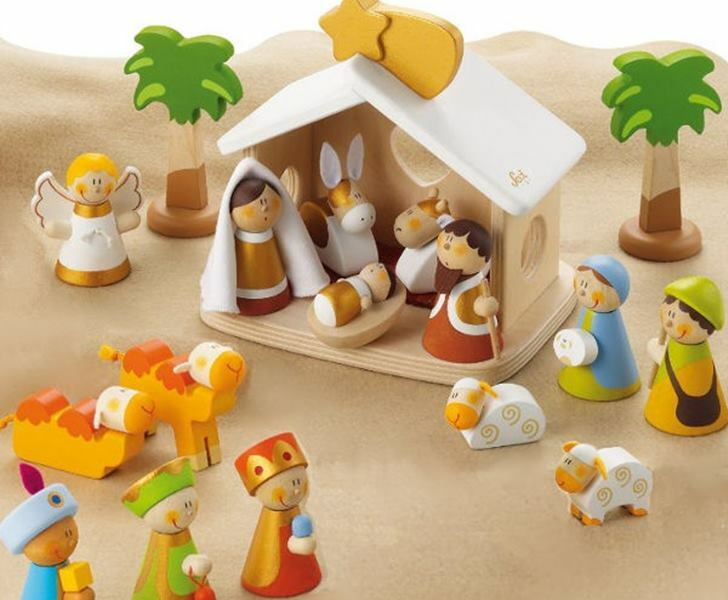 Celebrate the holiday season with the festive and fun nativity play scene from Italian toy maker, Sevi! This beautifully designed wooden nativity set will enchant both young and old with it’s 20, sturdy, easy to grasp solid wood pieces that are perfect for display as decor or for kids who enjoy acting out nativity stories. All pigments and finishes on wooden parts are vegetable based, so your family can celebrate the holidays in a non-toxic and kid-friendly manner. Due to small parts, this set is recommended for children ages three years and older. Celebrate the holiday season with the festive and fun nativity play scene from Italian toy maker, Sevi! This beautifully�designed wooden�nativity set will enchant both young and old with it's�20, sturdy, easy to grasp solid wood pieces that are perfect for display as decor or for kids who enjoy acting out nativity�stories. All pigments and finishes on wooden parts are vegetable based, so your family can celebrate the holidays in a�non-toxic and kid-friendly manner.�Due to small parts, this set is recommended for children ages three years and older.